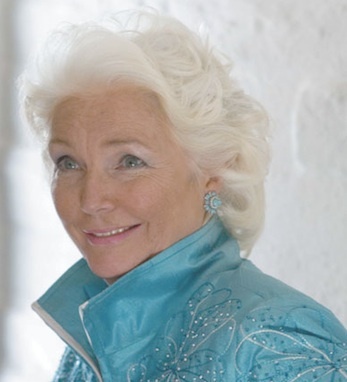 A star of the screen and stage, Fionnula Flanagan was born in Dublin in 1941. She was raised speaking English and Irish, and studied acting at the renowned Abbey Theatre. In 1968 she made her Broadway debut playing Maggie in Brian Friel’s Lovers. During the U.S. tour of Lovers she met her husband, Dublin-born psychiatrist Dr. Garrett O’Connor, and they made their home in Los Angeles. Dr. O’Connor, who was the chief psychiatrist at the Betty Ford Clinic, passed away in September 2015 at the couple’s home in Wicklow. In film, Flanagan has triumphed in an abundance of scene-stealing roles, in such gems as Some Mother’s Son, The Others, Waking Ned Devine, and The Guard. A familiar face in many American television shows and series, including Star Trek, Lost, Brotherhood, and Rich Man, Poor Man (for which she won an Emmy), Flanagan has also established herself as one of the eminent portrayers of James Joyce’s female characters. She first played Gerty MacDowell in the 1967 film of Ulysses, and went on to play Molly Bloom in the 1973 Broadway production of Ulysses in Nighttown and in James Joyce’s Women, Flanagan’s one woman show which she also adapted for the screen. In February 2012, President of Ireland Michael D. Higgins presented Flanagan with a Lifetime Achievement Award at the Irish Film and Television Awards, and in 2014 he presented her with the Presidential Distinguished Service Award. In July 2012, Fionnula was inducted into the Irish America Hall of Fame in a special ceremony in New Ross, Co. Wexford, Ireland. She is currently working on a project for the BBC.